Students who attend this 2-Day Tournament Strategy Workshop will receive world-class poker instruction and learn the systems the Pros use to survive (and thrive) in today’s highly competitive poker tournaments. Once you’ve learned the right moves to make, you’ll get a chance to immediately put your skills into action at the WPT Borgata Main Event Seat Freeroll. 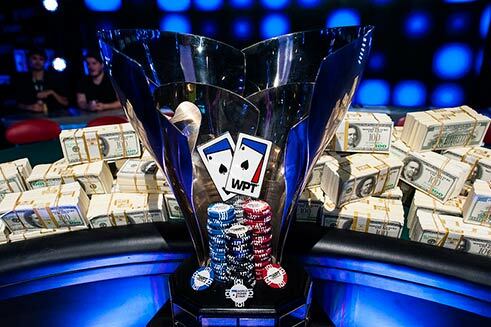 Take Your Shot to Win a WPT Borgata Main Event Seat! 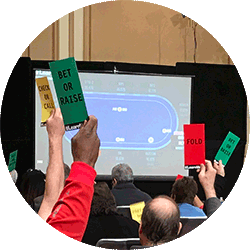 Attendees to the LearnWPT Live at Borgata Tournament Workshop will have the chance to put their skills to the test. 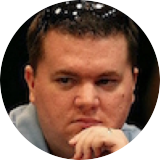 The WPT Borgata Main Event Seat Freeroll is not open to the general public. This opportunity is exclusive to attendees of the LearnWPT Live at Borgata Tournament Workshop being held September 16-17, 2017. $3500 WPT Main Event Borgata Poker Open Seat is non-transferable and has no cash value. Winner must play the awarded event seat. 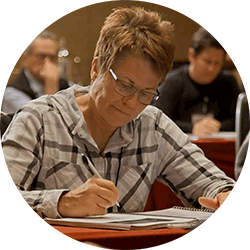 Don't miss this FREE 5 Part Video Series from LearnWPT Live! 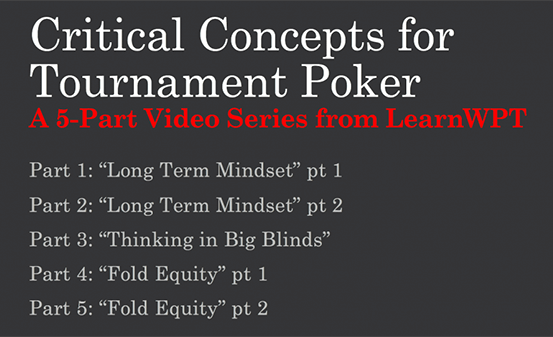 Watch these Critical Concepts for Tournament Poker now to gain the edge you need for tournament success. We’ll get started on the right foot by giving you the proper foundation for a Winning Tournament Strategy. 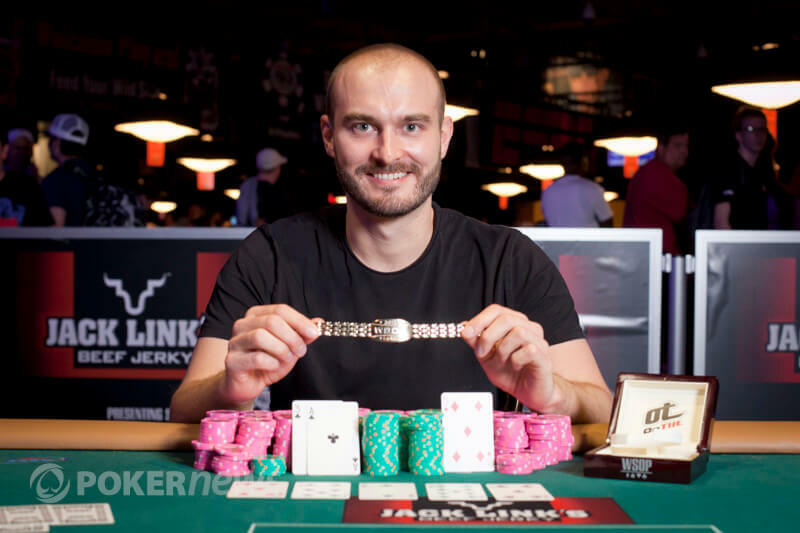 These are the keys to Tournament success, so we’re going to build you a poker foundation based on these essential components of winning play. All poker hands begin Preflop, and many end there as well! 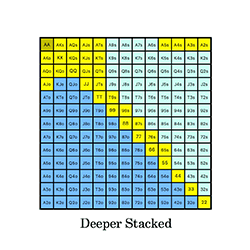 In this section we'll make sure your Preflop game plan is sound because it's where most players lose their footing. Set yourself up for Postflop success with a winning Preflop strategy. 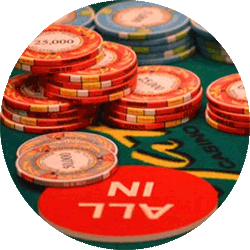 Being card dead is NO EXCUSE for not accumulating chips during a poker tournament. After this session you'll understand why and how to go after pots that others won't fight for as well as how (and when) to use your stack as a weapon to bully the table. Learn the techniques Pros use to run over tables and build their stack regardless of the cards they're dealt. Ever wonder how they do it? This session will show you what your game has been missing. We’ll spend some time applying what we’ve learned with a series of Preflop Tournament Situations. There's no better way to practice Tournament decision making than to do so in real-time, under pressure (you'll have a short time-limit for each decision), with Pro players there to review and improve your thought process after each one. You'll be able to ask questions throughout the weekend, but this is a dedicated check-in time to make sure you don't leave with ANY questions about Tournament Poker. Next we'll dive into the nuances of Postflop play, giving you the key factors to consider when making Postflop decisions. Many players find that some of the toughest decisions they make in a poker tournament happen Postflop. After this session you'll have a clear framework to approach Postflop decision-making. 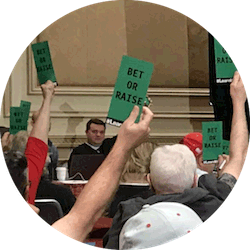 We’ll spend some time applying what we’ve learned with a series of Tournament Simulation Hands. Don't wait until your first deep run to start thinking about how to handle bubbles, pay jumps, or how to make deals at the final table. The Pros already have their game plan, make sure you have yours. It's time to shuffle up and deal! You'll be playing a Freeroll Tournament for a $3500 WPT Borgata Open Main Event seat! 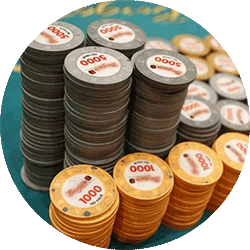 Ready for Better Results in Poker Tournaments? 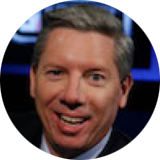 LearnWPT Live at Borgata will show you how to get them. 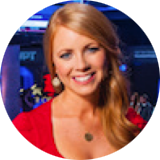 Anchor of the World Poker Tour, Lynn Gilmartin has a few words to share with you if you’re considering joining LearnWPT at Borgata this September 16th-17th. We asked students what they thought of their experience of a LearnWPT Live Workshop. 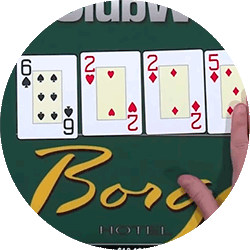 If you're considering joining us at Borgata, this video is for you. 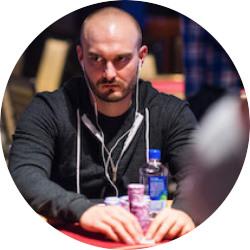 ""If you're serious about your game, you have to be serious about poker education. I've never seen a good player that didn't feel like they needed to learn more about the game." One of the most accomplished tournament Pros in the world. 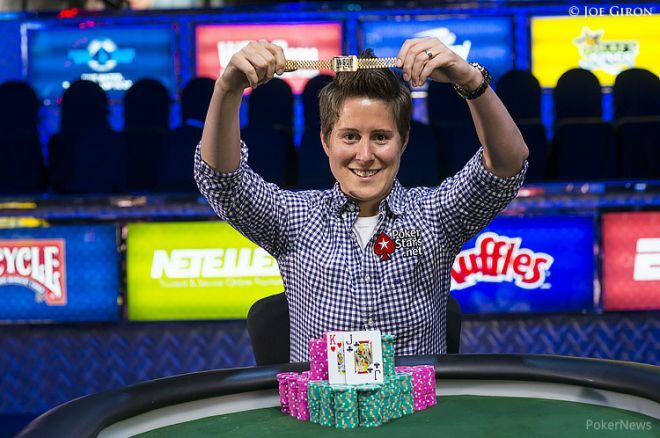 Vanessa Selbst is one of the most accomplished and respected professional poker players in the world today. Getting her start over 10 years ago playing in online and live NLHE and PLO cash games, Vanessa quickly rose through the ranks of poker. She joined the live tournament scene in 2007 and never looked back (apart from a two year hiatus she took to go to law school). Vanessa is the the only woman to ever reach the number one ranking in the world on the Global Poker Index and is currently the highest earning female poker player of all time. 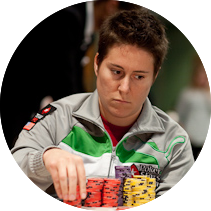 She is an ambassador for poker as a Team Pokerstars Pro and has coached some of the top poker players in the game today. Her incisive thinking makes her both a formidable opponent at the table and an enormous asset to her students. Tickets available online only, until September 10th, 2017. A: Lunch is included on both Saturday and Sunday. Breakfast is not provided, so plan to grab breakfast each morning at any of Borgata's incredible array of dining options. Coffee, tea, water, and soft drinks will be provided on both Saturday and Sunday. A: Yes. There is a discounted rate for LearnWPT Live at Borgata attendees. Room rates are Sunday-Thursday $95 per night (plus resort fees and tax), Friday $169 (plus resort fees and tax), and Saturday $269 (plus resort fees and tax). Valid booking period starts 6/5/2017. You will receive instructions on how to book your room at this discounted rate with your ticket receipt. A: Yes! You may cancel and get a full refund anytime before September 8th, 2017.